View toward El Poblado from Pueblito Paisa. The upscale El Poblado neighborhood located south of Medellin’s city center is considered one of the most prestigious neighborhoods in the city. 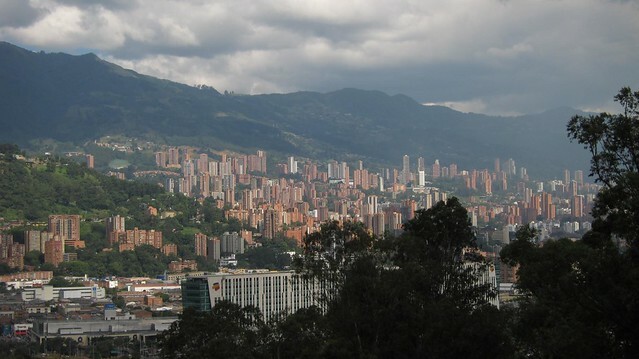 The neighborhood boomed in the early 90’s when Medellin’s elite fled the violence in Centro (the city center), and began building up luxurious apartment building on the eastern side of the Aburra Valley. The streets are winding and tree-lined, complete with rippling creeks, nature paths and parks dotting the area. Probably the wealthiest and safest neighborhood with a close proximity to the center, El Poblado definitely has its appeals. For nightlife, the Zona Rosa surrounding Parque Lleras is full of clubs, nice restaurants and hip bars. Parque Pobaldo is spacious, and at night, full of young people drinking and chatting. 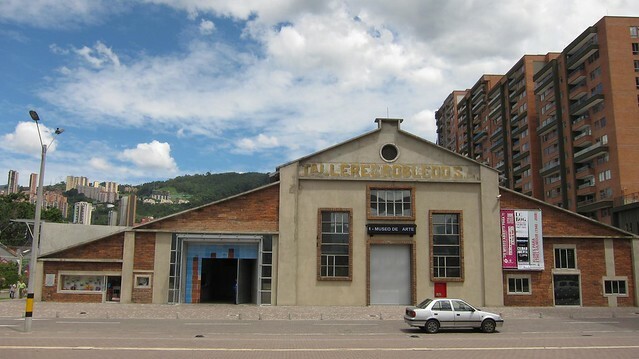 El Poblado is home to boutique shops, and high-end shopping malls, including: Santa Fe, La Strada, Oviedo and El Tesoro. One stretch of Avenida Poblado that extends from Parque Poblado south to the Santa Fe mall features several medical clinics, more than a few of which cater to the local women’s penchant for plastic surgery. This Medellin neighborhood most closely resembles one that could be found in Panama City, Miami or Los Angeles. One can find doggie groomers, yoga studios and gourmet grocery stores. Well-dressed people drive SUV’s and dine al fresco. There are very few homeless people and a strong police presence, which lends to an overall feeling of safety and comfort. It can be a comfortable place to live for foreigners moving to Medellin, as long as they are willing to fork out a few extra bucks for a place that feels like a safe suburb of the city. The apartments higher up the mountainside offer stunning views of Medellin. Some drawbacks could be that the affluence of the area hikes up the cost of living. Also, some residential areas are far from any restaurants, shops or bars, thereby necessitating a taxi just to get a bite to eat. New arrivals to Medellin should know that El Poblado looks nothing like the the other 90% of the city and metro area. It is essentially a wealthy suburb that offers Medellin’s elite a western lifestyle with all the creature comforts money can buy. It lacks the colors, smells and humanity of other Medellin barrios. But for great Thai food, a designer cocktail in the shade or a local designer’s boutique, and people watching on a Saturday night, El Poblado is undoubtedly the spot. Despite the outward appearance of safety in this part of the city, always exercise caution and stay aware of your surroundings. Thieves know that most foreigners stay in El Poblado, and therefore consider the area a target rich environment. At night, especially after drinking alcohol, if you are alone, or you are a woman, take a taxi versus walking back to your hostel or home. It is sad. Corruption among the elite families and political leaders is still predominant. It is very frustrating and most people feel helpless. It is the very same situation in the USA. It’s the way of the world I fear. Looking at the picture, Poblano reminds me of an upscale area in Quito called Gonzalez Suarez. The area look nearly identical. I ma interested to see Medellin, I also like Colombian made products, I see high quality in them. Will be planning a trip with my husband in 2015 to see the City and , of course, El Poblano with its cafes and restaurants. Corruption is not just in Colombia it is world wide. Unfortunately. I will be travelling alone in Medellin in september for the moment my spanish is very Low but working on making it better. I wanted to know if ever anyone here stayed in happy buddha boutique hostel ? how was the experience and if it’s quite safe. I should be arrive at the airport (Aeropuerto Internacional José María Córdova) around 9pm on a saturday since most flight from canada arrive at that time. I’ve read alot about people saying not to travel at night etc. Any tips ? I know my hostel offer secure pick up for the same price of a taxi but I just wanted to get so tips to make the best of my trip. Thanks in advance. I typically arrive even later than that as I normally fly JetBlue from the U.S. from Fort Lauderdale on a flight that gets to Medellín at about midnight. Even that late there are taxis available at the airport and I have never encountered a problem in 5+ years. At the time you arrive you won’t have a problem in finding a taxi at the airport, Just give the taxi the address of happy buddha boutique hostel. Im staying just up the hill from park llera in poblado medellin. Nobody has mentioned, it is quite a hill! Lots of traffic up and down. I don’t want clubs and heavy drinking. Can anyone suggest a nice restaurant? Can you suggest any good day trips? Theatres? Cant find a travel agent. Medellin itself is pretty exhausting. Spent ages looking for the museum. Love Botero’s work. I’d never heard of him. People are very friendly and helpful but the traffic! If i would have the feeling that it is safe for me to stay in other neighbourhoods of Medelin than El Poblado, I would definitaly do that. I love the Colombian lifestyle and everything I have seen so far, but I will try to avoid unsafe places at all times, even if that means that the rich neighbourhoods are getting richer.